My pictures of the sunrises and sunsets never seem to get old to me and the pictures are never as good as seeing them firsthand. 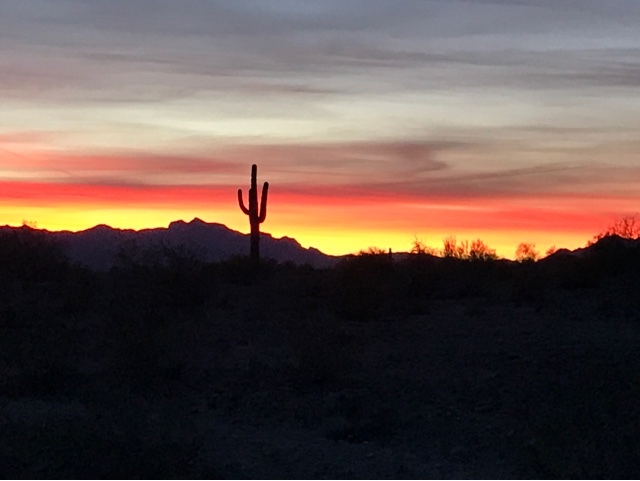 Good Morning Quartzsite! My day was laid back, driving to Yuma, then being denied purchasing gas, because Discover thought the purchase may be a fraud. Circle-K sent a charge of $125.00 to reserve a dollar amount until I finished pumping, to prevent nonpayment drive offs. Then my Discover card denied the charge and I couldn't pump gas. I started driving off and got the text from Discover and answered their online questions, and then the fraud office called to validate and reinstate my card. My gas purchase was $6.75 for my Prius for a half a tank but they hold $125.00. Doesn't seem logical does it. I then stopped in Walmart in Yuma and didn't buy anything as I went in to just look around. Then it was off to a Meetup with a vandweller friend with a gift. The highlight of the day was being the person to bring a gift to another vandweller. I was at the RTR talking to a full-time solo Woman Vandweller who was saving up to buy a solar panel for her vehicle roof, to charge her vehicle battery. She had forgotten and left things plugged in and drained the vehicle battery down and it wouldn't start while at the RTR. This is the last thing that a vandweller wants to happen and be stranded. 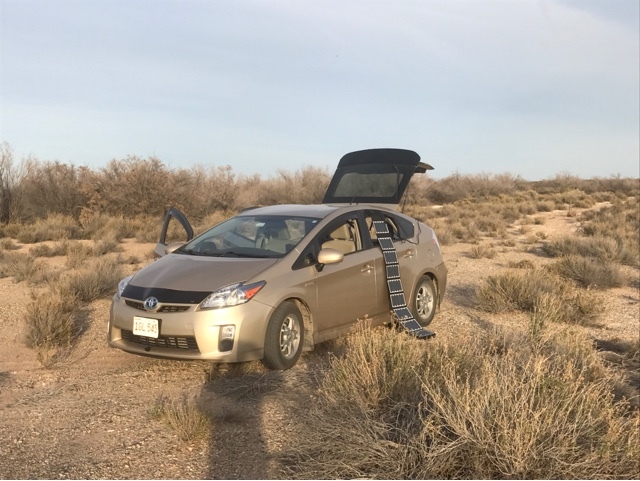 We discussed that the solar panel was the right idea and that the next step would be to get a house battery, so she wouldn't need to use her vehicle battery other than when running the engine. My comments were that I would keep an eye out for a good used battery. Then yesterday I met a couple that had upgraded their solar system and battery from a single 12 v AGM to two 6v AGM batteries. They asked if I knew someone that could use it. I messaged my solo female friend and she is getting the solar installed on her vehicle next week and didn't have a battery yet. So, that was a quick match between the people that was offering up the battery and someone that needed it. The nice part about the vandweller group that we are part of is the helping of others and sharing extra with others. Each year there is a tarp at the RTR where people put items they do not want anymore and people pick them up and put them to use and put something else down in it's place. This goes on for 10 days. There is always someone in need and others that are willing to help. 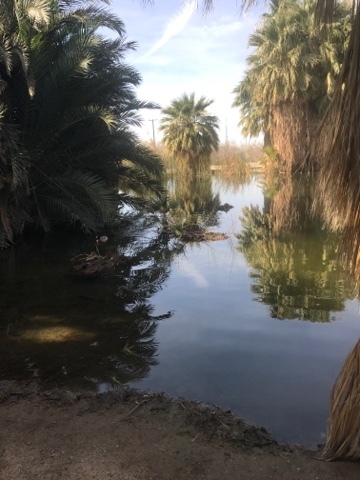 I made the drop off of the battery at Holtville Springs, CA where this oasis exists. This is where the vandweller and I were able to cross paths. As expected she was thrilled with the generosity of the 6 month lightly used battery for her new solar setup. My Prius getting afternoon solar for the LiFePo4 charging of the day. It was well into the 70's today here in Southern California, where I chose to stay the afternoon. 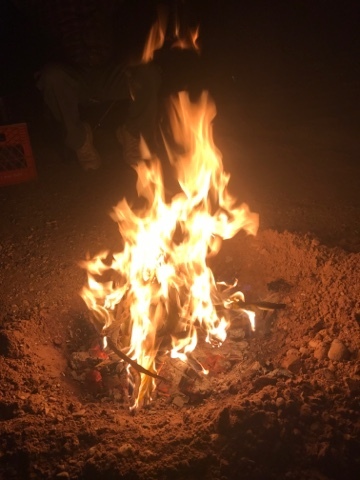 I enjoyed an evening campfire with a small group of folks from the RTR. They were very nice to offer me to hang out with them for the night and even shared some of their goulash that I mixed into my noodles and green beans. Tomorrow I arrive at my next destination for a week.